After botching his latest job, mob hitman Walter is forced to leave the city. He takes an offer to work for crime boss Berger who is hiding out in a remote region of the Carpathian Mountains. What at first seems like a holiday in the mountains soon becomes a nightmare for everyone involved. Snowman's Land is a film written and directed by German filmmaker Tomasz Thomson. It premiered at the 2010 Max Ophüls Film Festival in Saarbrücken, an annual festival that began in 1980, intended for young filmmakers from Germany, Austria and Switzerland. It is the story of Walter (Jürgen Rißmann), a contract killer who runs into some bad luck with his previous assignment and is forced to take some time away to cool off. So he accepts an offer to do an 'easy job' for Berger (Reiner Schöne) a former mob boss now hiding out in a remote winter resort in Eastern Europe. On the way there, he meets up with old acquaintance Micky (Thomas Wodianka) a none too bright criminal who is more pleased to see Walter than the other way around. When they arrive at the mountain resort, they meet Berger's mistress Sibylle (Eva-Katrin Hermann), a party girl who informs them that Berger is away on a hunting excursion and will return in a couple days. What follows is a series of mishaps for Walter and Micky that quickly and irreversibly spiral out of control. Thomson's film fits squarely in the mold of a quirky indie comedy. All the elements are there for this to be a cult classic, with an ironic narrator, unique setting, weird characters who deliver even weirder dialog, and a hip soundtrack (highlighted by choice tracks from Herman Dune, Menomena, and Born Ruffians). The cinematography, shot with my favorite piece of digital equipment, the Red One camera, is amazing. Some film purists may not like the super crisp high resolution look, that I've heard described as cold and metallic, but I find in the right hands, it makes everything appear absolutely gorgeous. The acting was great especially from Jürgen Rißman who plays Walter with a quiet aura of depression but with a nothing left to lose carefree attitude at the same time. Basically a man resigned, expecting and accepting that the world is taking him for a ride. Also notable was Thomas Wodianka's bumbling Micky, who is hilarious to watch as a stupid and mischievous individual who can't keep his hand out of the cookie jar, and you really get the impression that he's probably only survived so long purely out of dumb luck. 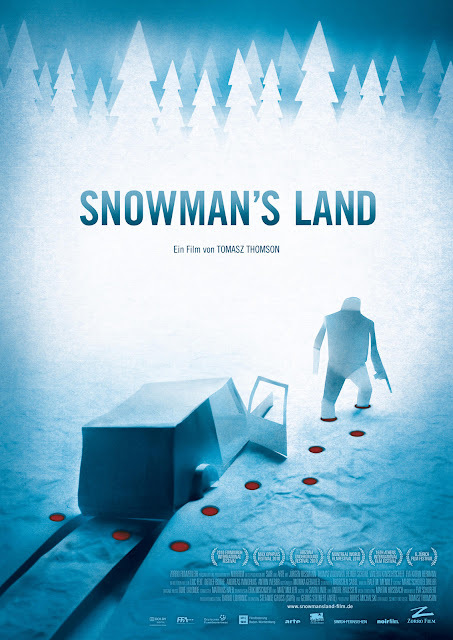 The problem with Snowman's Land lies in the writing and screenplay. The plot is set up nicely but once it starts moving, it doesn't know where it's going. Lacking a clear and concise direction, things just seem to happen randomly without a good enough reason or explanation. Also there was a real missed opportunity with the ever present mysterious evil forces lurking in the woods. An enemy that all the characters can see and hear, but the audience never does. Like the film as a whole, it was a good concept but one that is never explored to its full potential, and ultimately feels unsatisfying the way it is presented. Not to say that this is a bad film, just a disappointing one considering it had all the pieces for greatness. Worth a watch if you enjoy dark crime comedies, just don't expect anything on the level of Fargo. Ah, ok, thanks. Because the first guy had his back to us I thought it was the right one. hmm that poster is pretty cool though. I uh, I got a little confused from the trailer. He still ends up killing the same guy, just not as smoothly? What did I miss? love the artwork for it! Yeah it is. I love that style whatever it's called. The trailer looks like it makes for an entertaining film but your description of Micky will probably turn me away. I hate 'bumbling' characters like that. I feel like it's a cheap way to keep the plot moving in a certain direction when the story writer needs it to do so but can't figure a way to go about it. In lieu of a progression of events you get 'this guy' to do 'this thing'. Why? He's dumb *nyuk nyuk nyuk*. You make a great point there, now that I think about it, characters like that are a bit overused and annoying. Highlighting foreign, independent, and cult cinema that many may not be aware of. In the hopes of encouraging others to explore a film they've never seen, or revisit one that they adore again.